We've done it! 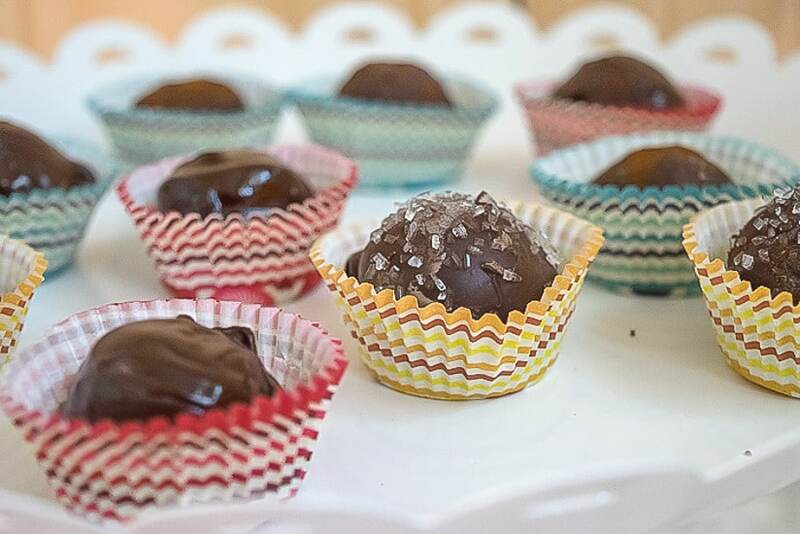 We have found the best chocolate truffle recipe and I'd love to share it with your. Step by step, illustrated recipe & directions on how to make chocolate truffles – a Valentines Day treat! Hello my sweets! Boy oh boy, do I ever have a treat for you! While we do celebrate Valentine's Day around here, it's a little low key. Terry and I exchange cards and maybe a box of chocolates, but not much more. When the kids were young, Terry and I would orchestrate a scavenger hunt for them. It was always fun, but not sure how it related to Valentine's Day. In any event, as the kids have gotten older, Valentine's Day has been a bit of an afterthought. But this year I got my act in motion and decided to try my hand at figuring out how to make chocolate truffles. 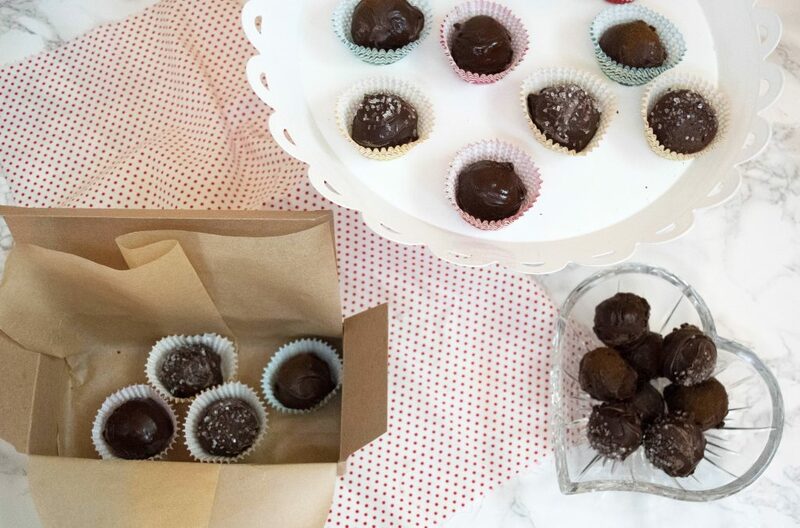 I did a whole bunch of research on making chocolate truffles and found chocolate truffle recipes from both ends of the difficulty spectrum and everything in between. I knew I wanted to make an ‘assortment' of chocolate truffles to satisfy the assorted taste buds of my family. I'm all about the fruit + chocolate combination, while Terry ♥s anything with coffee in it, and normally picky Rob is an equal opportunity devour-er of all varieties chocolate. 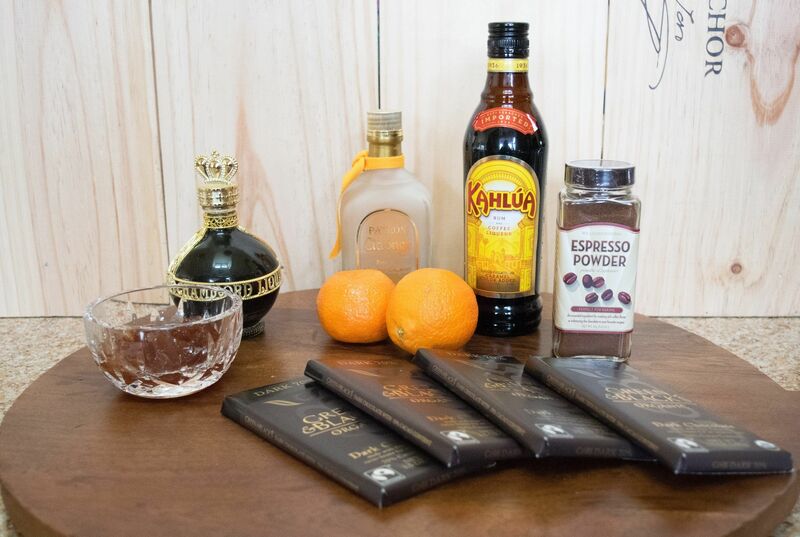 So, I decided to make Chambord Raspberry Truffles, Espresso Kahlua Truffles, and Orange Triple Sec Truffles. And, as fate may have it while pondering how to make chocolate truffles, I happened upon a big sale at Williams-Sonoma and found these cute paper liners on sale. They worked perfectly to differentiate between the different flavors. Amazon has some great options as well…check them out here. I made one recipe of a basic chocolate truffles mixture, divided the mixture between 3 bowls and then added the flavorings and liqueurs to each bowl. I have written out the directions for my flavors below, but feel free to experiment with your own flavorings. My Lemon Equivalents Chart was so very handy when figuring out how many tablespoons in a cup or teaspoons in a tablespoon. After letting the chocolate truffle mixture firm up, I used my small OXO cookie scoop to make well formed chocolate truffles. This process would be much harder without a scoop like this. At first I was going to keep it simple and make the flavored chocolate truffles without a crisp/hard coating, but they really were too soft. 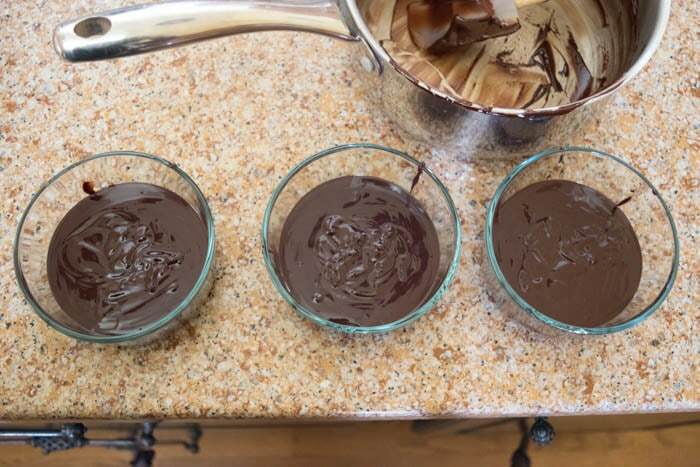 So, after doing a little more research on the internet, I settled on Alton Brown's method for making our chocolate truffles with a hard shell. While simpler sounding than most out there, it was still messy and involved, but very doable and worth the effort. It suggested slowly melting the chocolate in a bowl, nestled into a heating pad in another bowl. I used my food processor to chop up my chocolate. Pulse so that your pieces are about the size of peas. In the photo, shown below, some of my pieces were a tad to big. In a heavy saucepan, bring the cream just to a boil over medium heat and then remove it from the burner. Add the butter, piece by piece, stirring until it is incorporated. 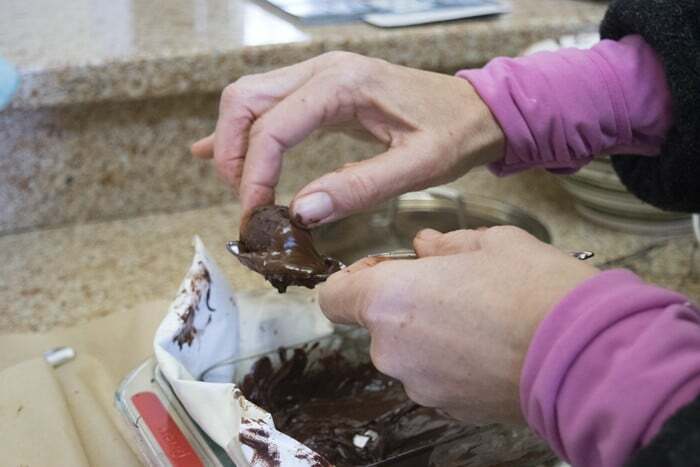 Divide your chocolate into 3 glass bowls and add the flavorings. If you want all raspberry truffles, then multiple the raspberry ingredients by 3. Same for the espresso and the orange. 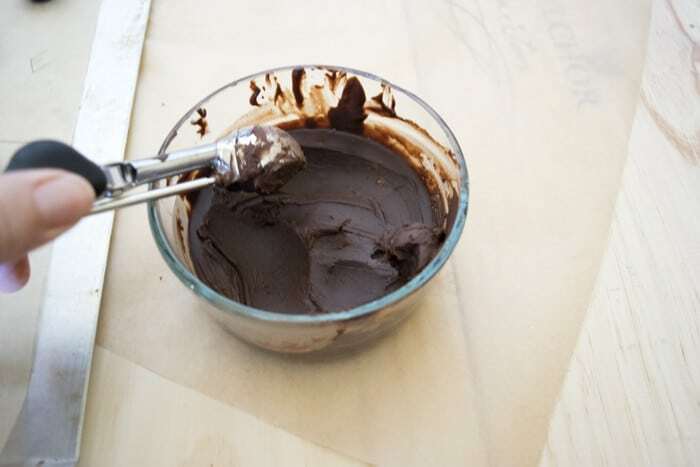 Cover your bowls and let them sit briefly in the fridge or on your counter until the chocolate has firmed up a bit. If you refrigerate your chocolate, you may need to let it come to room temperature in order to scoop it. Once firm, scoop your truffle mix onto parchment lined cookie sheets and refrigerate until firm, 1-2 hours. 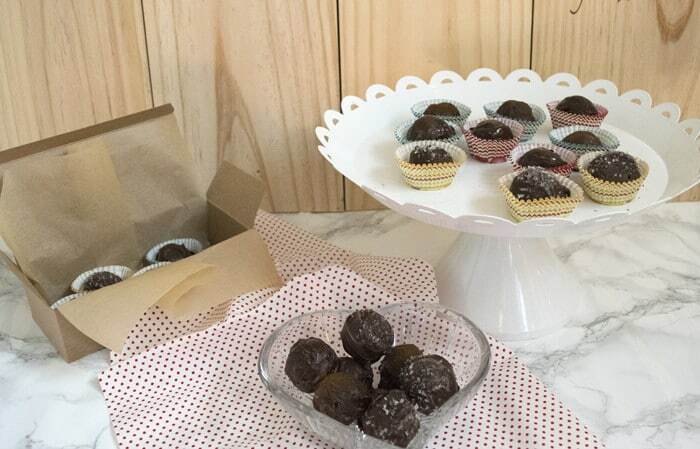 About 1/2 hours before you want to coat your truffles, put your 10 ounces of chocolate chips into a bowl that is nestled into a heating pad in another bowl, and set the heating pad to medium. This method slowly melts the chocolate, keeping its structure intact to form a hard coating. Occasionally stir your chocolate chips. Put a thermometer in your chocolate chips and monitor the temperature. You want it to be between 90' and 92'. Alton claims that if it gets above 94' it will lose it's 'snap' when you bite into it. I know that my temp did get above 94', does still snap, but is a little gray in parts. Once your chips are at the right temp, turn heating pad to low and get busy coating your truffles. I put a little bit of the melted chocolate on a spoon and used a toothpick to pick up a truffle and roll it in the soft chocolate. I did find it best to do it in 2 stages. I would coat the bottom of the truffle first and once that was hard I'd go back and do the top and sides. Seems I got a cleaner look that way. It's tough to get all sides coated evenly before the chocolate starts hardening and this method worked best for me. So, I'm pretty pleased with my first foray into the world of how to make chocolate truffles. And more importantly, my men are pleased with results and this will become our best chocolate truffle recipe. These sweets are perfect with their crisp shell which yields to the soft flavorable center. Um…yum…. I found these candy boxes on Amazon. They are the perfect size for 6-8 truffles…ideal for gift giving. Pin it for your future reference. So, if you’d like to get in on the ‘subscriber benefit’ action, simply subscribe to Nourish and Nestle using the form on the right sidebar. It’s towards the top a bit. Or, you can subscribe by clicking the box right below. I have sent all my subscribers the link to the Subscriber Benefits Library, but if you missed it or misplaced it, drop me a line. These look absolutely delicious! I love, love truffles. Hi Susanna, thanks for stopping by today. What’s not to love about truffles!? They are tasty little morsels…hope you give them a try. I am a reformed chocolate addict. This is making me go crazy. I am going to try it and share it so I don’t eat them all. Natasha, which begs the question…why would anyone try to ‘reform’ from chocolate addiction? ? Don’t you know chocolate is good for you? Especially if you have tiny tots in the house…it keeps you sane. Darn Jaime…if you had just told me that before my boys ate them all!? They were quite the tasty little morsels…I have to admit. Thanks for stopping by. I even think hubby would be pleased to get these for valentines day! (Men can be so hard to find gifts for) me I would revel in them and wish for more! If your hubby likes chocolate at all, he will love them…as will you you. Quite the tummy yummy. Oh yum! I would be very happy if my Valentine made me a box of delicious truffles. I might be waiting a while for that to happen though, so maybe I should make him a box to share! Carlee…I would wait forever if I waited for my honey to make these…he did take some photos and taste them for me…so I guess that counts as helping. Give them a try…I know you will enjoy them. I think we might be in the same boat! That’s ok, I can’t imagine the results or the mess that might be left behind. Hey Carlee…that’s a big consideration. It’s much easier for us to make and clean up than for them to make and us to clean up! Happy Sunday and looking forward to reading about your Nann! Who wouldn’t wanna love to eat all of these! Wow, I’ve never tried Truffles before…i mean I’ve tried them as in tasted them, lol, but never made them myself! I think I’d love the three versions, probably the Espresso the most! They look so pretty in those boxes, perfect for V~day! A great gift, I think I’d keep them and eat them all!!! Hi sweet Katrin, glad to hear from you today. You have got to love bon bons! I mean, who doesn’t? Don’t know that I’ve met anyone who doesn’t like chocolate. And, given all that I’ve seen you make, I know you would be successful with these truffles. Give them a whirl! Lynn, did I ever tell you that my daughter wants to become a pastry chef? This would be perfect for her and I am drooling over the kaluha combination. I’ll let her use me as the guinea pig. Thanks for all the research so we can enjoy the fruits of your labor! I didn’t know that about your daughter! Wow, that’s dangerous. But you wouldn’t be doing your job as her mom if you weren’t her guinea pig. Tough job but someone has to do it. BTW…at your suggestion, we are watching ‘The Wire’ as I type this! We’re on season 3, thanks for the suggestion. Oh, those look so delicious! And that’s a great idea to use a hot pad to melt the chocolate coating. I can’t wait to try these. Hi Rebecca. The hot pad seemed to work like a charm. So glad I stumbled upon that idea. And the truffles are absolutely yummy! Happy Sunday. Hello chocolate!! These look amazing! Good Morning Julie, a match made in heaven…Kale & Wheat Berry Salad and truffles. See, that’s how I balance my little tummy yummies every now and again. Thanks for stopping by and for providing the necessary balance in my world. I’m on the way. I’m just moving in. If it’s okay I’ll take over your daughter’s bedroom while she’s gone, snuggle under that chunky throw and eat these truffles/bonbons!! It would be like a mini vacation! LOL Plus I’d get to hang out with you and Terry! The best! Nikki, Aw…Terry and I would love to hang with you! Come on over!! ohhhh i can make my own!?! use the flavors I want and like!?!? you are a hero!! thanks for sharing the recipe and tute with us at the Valentine’s party! Girlfriend, you can invent your flavors and mix and match them any way you want! Isn’t that exciting. Towards the end of my truffle making I thought a dark chocolate vanilla interior with sea salt sprinkles would be an outstanding combination as well, but ran out of mix. Will definitely put that on my truffle to do list. Thanks so much for stopping by for a visit. Hi Danita, they are pretty tasty if I must say so myself…unfortunately, I don’t think there will be any left for Valentine’s Day at the rate my boys are plowing threw them. And I can’t make any more because then I’ll eat some too…you know how that works. Glad to spend a little time at #smallvictories. Wow! I’ve never made truffles before, but I think I might have to try these! What a great gift for Valentine’s Day! They look amazing, Lynn! Oh I know you could do these Robin, really very easy and I’ve seen some of the stuff you do! And I’m sure your boys (big and small) would love them. I LOVE truffles, but I’ve never made them. You’ve made it look really easy.